Protein post-translational modifications (PTMs), such as phosphorylation, ubiquitination, acetylation and methylation, play critical roles in diverse biological processes such as signaling and regulatory processes, protein activity and degradation, regulation of gene expression, etc. Identification and characterization of PTMs are essential for a comprehensive understanding of cellular biology and human diseases and have a wide range of applications. 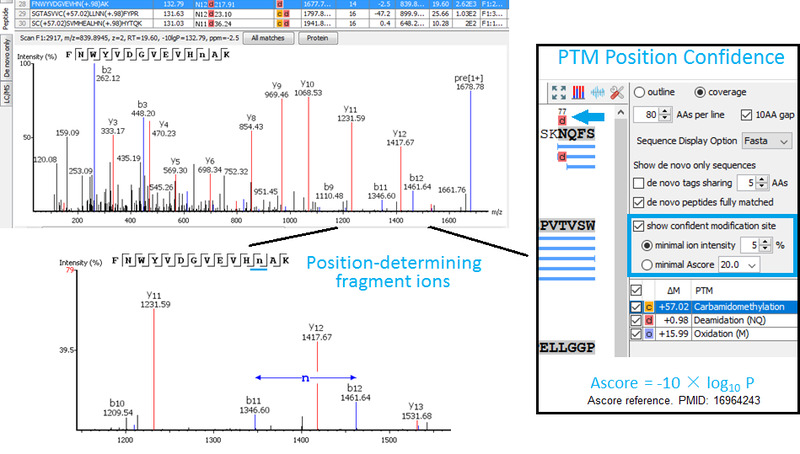 Since PTM information is usually absent or incomplete in protein databases, identification of PTMs via mass spectrometry poses a number of challenges to the traditional database search approach. The advanced algorithm included in PEAKS maximizes PTM identification and PTM Profiling. PTM identification of PTMs is achieved by integrating PEAKS database searching and de novo sequencing results. The PTM Profile tool further assists your PTM studies by providing qualitative and quantitative information and direct visualization and easy export of results. 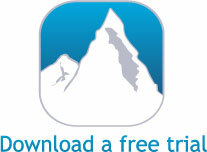 PTM identification can be performed in PEAKS database searching and PEAKS PTM searching. In database searching, only a limited number of frequent known PTMs can be specified as variable modifications. 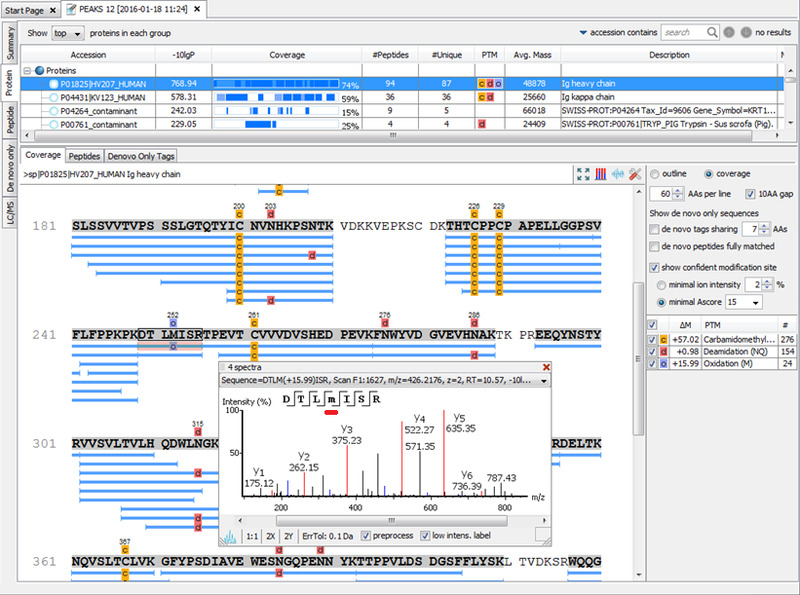 In protein result view, supporting peptides represented by blue bars are mapped to the sequence of the selected protein. 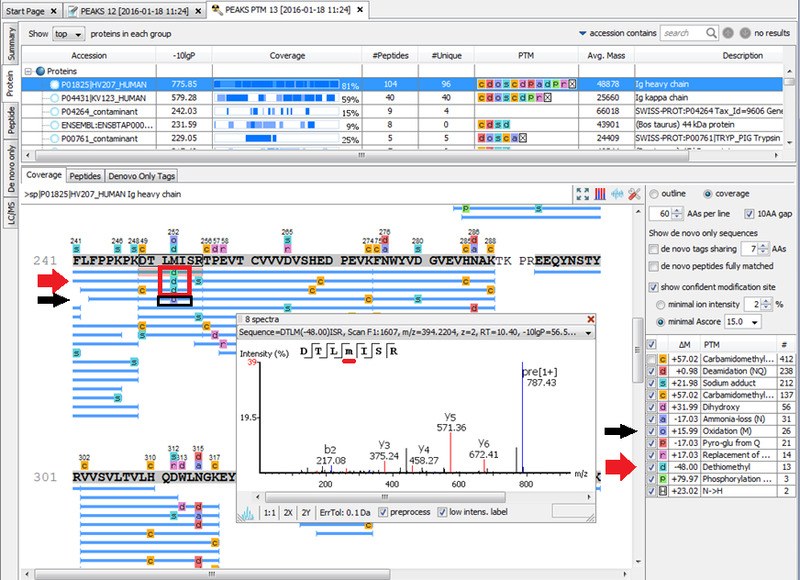 By clicking the peptide, its MS2 spectrum will show up, where you can easily examine the annotated MS data. Amino acids that have PTMs are in lower-case in the peptide sequence in its MS2 spectrum window, e.g. oxidized methionine in the sequence: DTLmISR, as shown in the figure. PEAKS PTM is specifically designed to discover hidden modifications by integrating the powerful de novo sequencing algorithm and database searching. PEAKS PTM algorithm is used to identify more PTMs. 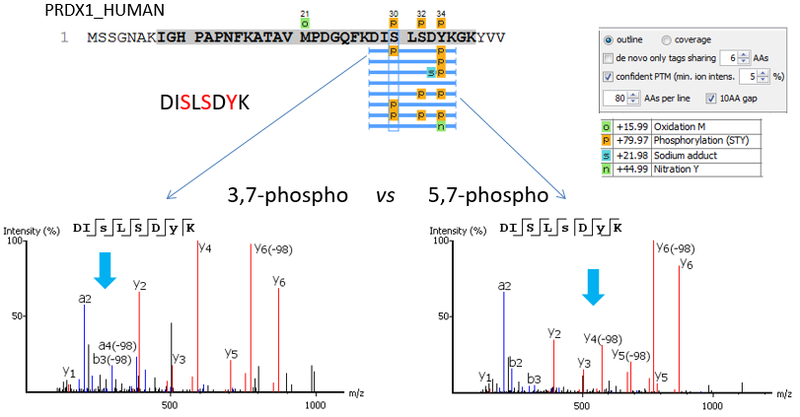 In this round, only the spectra with high confident de novo scores but are not assigned by database searching are mapped against the identified proteins. Users can specify as many PTMs as they want. Or they can simply turn on all of the over 650 PTMs and mutations in the Unimod database. PEAKS PTM identified an additional modification, i.e. dethiomethyl (red color in the figure), in addition to oxidation (black color in the figure) found by database searching, in peptide: DTLMISR. The exact site of modification can be determined by the presence of site-determining fragment ions. In the example shown, the presence of b11 and b-12 ions in the MS2 spectrum determines the deamination occurs on asparagine at position 12. Minimal ion intensity, which requires that the relative intensities of the position-determining fragment ions in a MS/MS spectrum must be higher than the number users input. Ascore, which calculates an ambiguity score as -10 × log10 P. The p value indicates the likelihood that the peptide is matched by chance. Therefore the higher Ascore the better. Both methods provide measures of the confidence that can be placed onto the PTM site localization. If the threshold of the method users select is met, the PTM will be in a colored box above the residue in protein coverage view result. PEAKS PTM Profile provides a direct visualization and summary of the quantitative information (e.g. 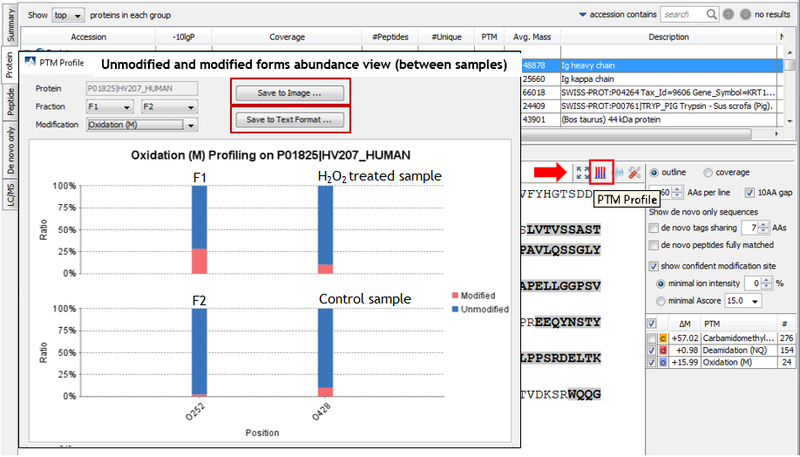 abundance of modified and unmodified forms containing the PTM sites identified). 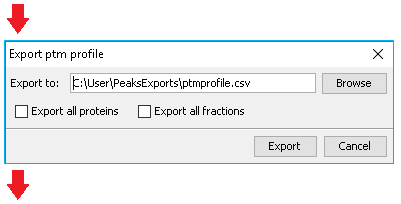 PTM Profile results can be exported to images and csv files containing detailed quantification information for users. Han, X. et al. 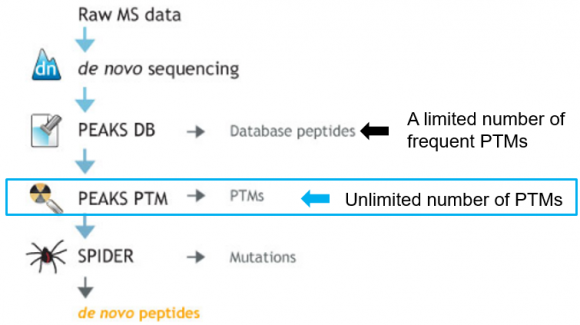 PEAKS PTM: Mass Spectrometry-Based Identification of Peptides with Unspecified Modifications. Journal of Proteomics Research. 10(7), 2930-2936. 24/05/2011.